In many ways the innovative genius of Ferdinand Porsche was similar to the one of the Italian and both had to deal with the darkest powers of Europe in the century. Born in Austria in 1827, he had a knick for engineering stuff from a very early age. Must have been a shock for his parents to see him going from setting up an electric system for the house to present a revolutionary electric car in Paris' Expo of 1900. If you consider putting electric motors in the wheels hubs a very ground breaking idea these days, think again. Because 23 years old Ferdinand already thought of it in this very car, the Lohner Porsche, and it was arguably also the first 4WD car. After leaving Lohner and working in different other makes such as Daimler, he decided to flirt with power, agreeing to work for the Austrian Emperor in building the Etrich Taube plane. But his dream was to build a car for everybody and when he heard Germany's prime minister wanted to build a car for his people he promptly applied. The brief was for a car capable of 100km/h, 7km/l and the capacity to carry the ideal german family: two adults and three kids. All this for two thirds of the price for the cheapest car on the market. The prime minister was obviously Adolf Hitler. Porsche promptly applied and the deal was sealed in an exceptional quick time. He eventually obtained all the independence and funds for his project in 1938, Independence and funds that didn't have before, when working on it at Zundapp and NSU. We all are familiar with the history and revolutionary characteristics of this car, eventually named Volkswagen "Beetle" or Type-1, so there will be no need to repeat them in this blog. 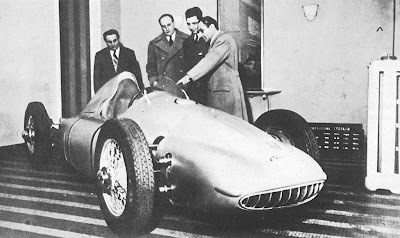 Porsche was also asked to work on the Auto Union racers that with a german driver at the wheel would make the führer proud and represent the so-called arian race all over the racing world. We are unfortunately also familiar with what Nazism created in Europe. Quite quickly Porsche's efforts had to be converted on all kind of war machinery, most notably the light all-purpose vehicle Kubelwagen and its variations. It's way too easy for us to be judgemental about Porsche's behaviour, but many times in history we had to see great innovators and geniuses dealing with all sorts of compromises in order to see their creatures coming to life. For sure we can never forget that in some of the factories slavery labour was employed and any affiliation with the Nazist cancer can be nothing but horrendous, but this is neither the place or the time for this kind of terrible considerations. Fact is that at the end of the war Porsche tried to escape in Austria, where the allies went to pick him up to chain him to his responsibilities. He was forced to move the Type-1 project and machinery to France as war reparations, but he was almost immediately forbidden to get back to work. With no chance to pay the huge amount of money for the war reparations anymore, his dream seemed gone forever. Porsche was stuck in the french prison of Dijon with a sentence of 20 years, eventually converted to house arrests, without even a trial. On the other side of the Alps economy was starting to live again and Dusio's businesses were booming. He was ready to pursue his ultimate desire: a Grand Prix winner. He found out about Ferdinand's situation and managed to organise a meeting with his son Ferry and daughter Louise. A deal was signed for the design of two cars, one GP racer, one turbine and even a tractor. All this was to be payed in three rates delivered every three months. He also managed to get 10 promising technicians to Turin for a little extra money and accommodation. Two of these technicians alone would have been more than worth the whole deal already: Rudolph Hruska and Carlo Abarth. Dusio used to keep on repeating "I'll go bust, but damn it... I'll make the Grand Prix". He stuck to his word and spent almost all of his money on it. Ferry Porsche started working immediately on the task, managing to get the money and free his dad as soon as possible. Time was paramount also for Dusio that needed the prototype on the track as soon as possible. The car was almost sci-fi for the time: rear engined, space frame chassis, oversquare engine, all-round independent suspensions, double overhead camshaft, 2 compressors and on/off integral traction. The compact 1,492.58cc flat 12 was capable of an excess of 380bhp at 10.000 but was preserved at a safer 350/8.000. This was the legendary Cisitalia 360, a car that would have certainly set the world of racing on different standards. Dusio's money ran out and he decided to run (away from creditors?) to Argentina smuggling the 360 in spares. He there managed to sign a deal with the president/dictator Juan Perón (Evita's husband) to open a new Argentinian company, effectively paying for Dusio's debts. He would come back to Italy and race in 1952 but he finally gave up in 1953 and got back to Buenos Aires for good. His son Carlo tried and revamp Cisitalia's dream in the end of the fifties, converting its business to coachworks in Racconigi, Turin's outskirts, but eventually gave up in 1963. As legend goes, after closing the gates for the last time, Carlo found himself in downtown Turin and with tears striping his face threw the 360's camshaft off one of the bridges of river Po. Old Man Foster! Thanks for the comment! Also I have read about the Devin, nice little car that is.